WINCHESTER, Va., Nov. 15, 2010 – Trex Company is introducing a line of energy-efficient LED dimmable deck lighting that combines safety with beauty. Available in multiple colors for a seamless, professional look, long-life Trex Deck Lighting™ features sophisticated, understated silhouettes that provide improved ambiance – as well as security – to an outdoor living space. True to Trex’s environmentally friendly heritage, each lighting option operates for up to 40,000 hours of life and surpasses traditional incandescent lighting by using 75 percent less energy and eliminating worry of voltage drops. In addition, the low-voltage lights are extremely durable, as well as weather-proof and salt-air resistant – ensuring that they will retain a “like new” appearance for years to come. The lights also are cool to the touch, making them safe for children and pets. “This collection also creates greater flexibility and design options for our consumers, and allows our current professional partners additional opportunities for sales in conjunction with our other Trex product lines as a total package,” said Kaplan. Trex Deck Lighting is protected by a seven-year warranty on the LED lights and housing and a three-year warranty on the dimmer, timer and transformer. The collection will be available at retail in February 2011. For more information about this and other Trex products, visit trex.com. 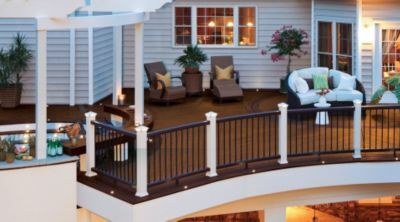 Trex Company is the nation’s largest manufacturer of wood-alternative decking and railing, with nearly 20 years of product experience. Built on “green” principles and values, Trex® outdoor living products offer significant design flexibility with fewer ongoing maintenance requirements than wood, as well as a truly environmentally responsible choice. The cornerstone of the Trex product portfolio is the new Trex Transcend® high-performance decking and railing system, which combines superior durability and aesthetics. In addition, Trex distributes ultra-low maintenance PVC decking under the trademark Trex Escapes® and PVC trim under the trademark TrexTrim™. For more information, visit the company’s website trex.com. Trex®, Trex Transcend®, Trex Escapes®, TrexTrim™ and Trex Deck Lighting™ are trademarks of Trex Company, Inc., Winchester, Va.